Continuing its phenomenal growth, virtualDCS welcomes Joe Brain to the company in his new role, with the help of QA Apprenticeships. The announcement comes shortly after Kieran Miller joined the team in a new customer support position. 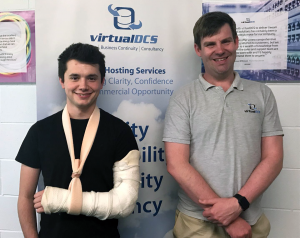 virtualDCS is an advocate of technology apprenticeships and student employability within the region, with Joe marking the fifth apprentice to join the company. Joe shared his thoughts around his new role at virtualDCS: “I’ve always been interested in technology and the expertise behind the cloud, so I’m excited to join the team and get stuck in. “We are immensely proud to help young talent in their journey into new careers working closely with fantastic companies like virtualDCS. They open the opportunities up for apprentices to gain qualifications and experience in the working environment.